MoreGuns mod is a dynamically developing mod that brings new weapons taken from real life. In the aggregate, there are only meelee weapons and also truncheons and knuckles but no firearms. The creator decided to go the other way and at first add only the initial type of weapons and then introduce more sophisticated weapons with ammunition and modifications. Some weapons do not have effects and are used similar to vanilla weapons. Each item can be crafted from a new iron and optional components. More weapons you will see in the MoreGuns mod Beta 2 and for now defend yourself or attack the enemies with this melee weapon. 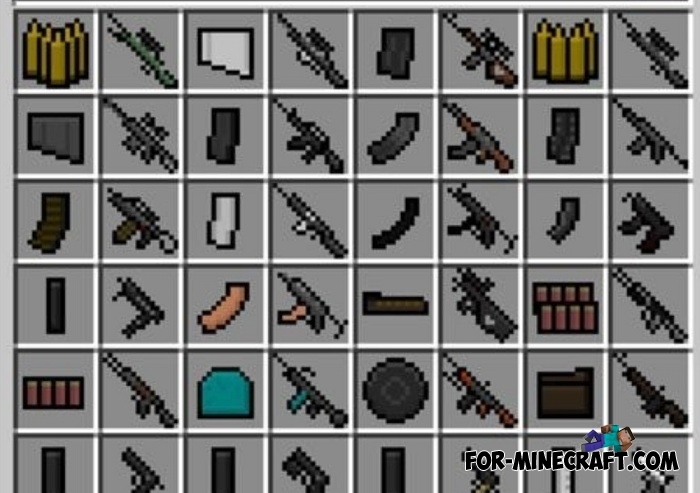 If you have not heard about the DesnoGun Mod, then do not miss the chance to get the largest arsenal of weapons that exists in Minecraft BE. Nowhere else will you find so many new weapons.